Halloween, Halloween, Halloween...oh, the debate about whether to participate in it. We've come to the conclusion that Halloween is an awesome opportunity to meet and bless people in the community. If you live in a neighborhood with kids, you will have a great opportunity to meet your neighbors on Halloween night. Isn't that something our churches are suggesting we do more of? So...this is how we celebrate Halloween as a family, by befriending and blessing our community. This year, like last, our home group is doing a Halloween party with a Chilli cook-off, games, and this great little photography company is taking free photos of kids in the costumes. 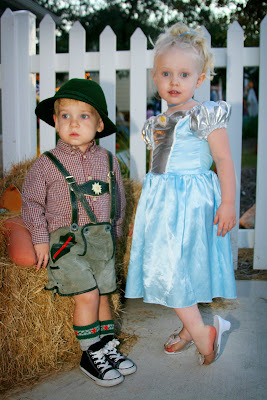 Anyway, we let the kids dress up, but, remember, I'm frugal and not willing to pay loads of money for costumes. I suggested to D'arcy that she be an angel. I have great angel wings as a prop for my business that I thought she could wear, but she insisted that she be a princess. "Mom, maybe next year I'll be an angel, but this year I plan on being a princess. Oh, and Julian can be my prince." I had other plans for Julian, though. 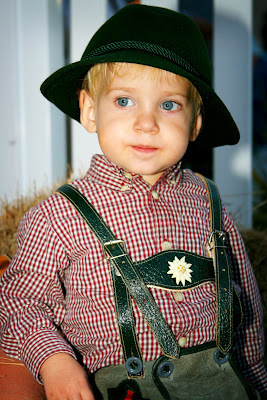 Stephen spent the first three years of his life in Germany, and had some awesome pairs of leiderhosen. So throw in a $3 shirt from a second hand store, and we have a perfect little German boy. He much enjoyed his costume and pointing out his flowers. Mommy much enjoyed having one child who she could still dress however she wanted. I did, though, require D'arcy to let me do her hair. That's one of the joys of having a little girl! 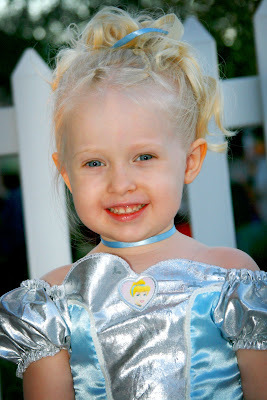 Tonight, D'arcy's preschool had a little Trick or Treat party so they'll get to wear their costumes twice. Enjoy some pictures. The last picture is of one of D'arcy's closest friends from school, Daniel.